Yesterday, I finally created an account at Pottermore and found out my official Hogwarts House! I don't know why it took me so long to get around to it. I first started reading the books after the third one came out, so that makes it 1999. At the time, I was instantly drawn to Ravenclaw -- it fit my personality perfectly. When the online quizzes and tests appeared, I did a couple and the result was always Ravenclaw, too. I was a dyed-in-the-wool Ravenclaw! Or was I? When chatting with Husband and some friends earlier this year, they said I struck them as being more of a Hufflepuff. Were the tests wrong, or perhaps I've changed? About a month ago, I came across a sorting system based on personality psychology. It's quite complicated, and there's no quiz -- you have to read through the desciptions and decide which one fits you best. The site is here and I would recommend it as an interesting exercise if you're interested in psychology. The system is two-tiered. Your Primary sort is based on your value system: why you do the things you do. Your Secondary sort is your methods: how you achieve the things you want to do. It also explains the concepts of Modelling and Performing. Choosing my House for the Secondary sort was easy: it was Ravenclaw far and away above the others. I had a very hard time choosing a House for the Primary sort, however. In the end, I tentatively chose Hufflepuff first, with Ravenclaw a close second. While this exercise and learning more about the psychology-based sorting system was very interesting, it left me even more confused than before. Can you be a RavenclawxHufflepuff? That's why I decided to join Pottermore, do the sorting quiz there and get the 'official' truth. Which is: I'm a proud Hufflepuff! It wasn't much of a surprise actually, when I think back on the last 15 years. I've changed in many ways. Learning and knowledge are still very important to me, but so is community and supporting others. (The rise of the internet is probably partly the reason for that.) In the last 3 years especially, since buying our house, gardening and plants have become a new and passionate hobby for me. That, more than anything else, is probably the reason my friends now think of me as a Hufflepuff! 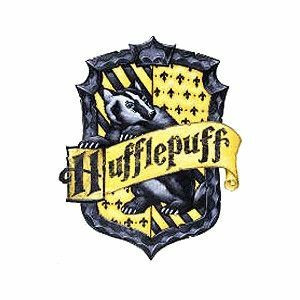 I am very happy to be a Hufflepuff, as I think it suits my personality the way it is now. And who knows, perhaps I would have been the student to build bridges between the Houses and show that Hufflepuffs aren't "duffers" after all! There's only one drawback to being a Hufflepuff. The House colours -- yellow and black -- are the same as a football team here in Melbourne. None of the other House's colours suffer from that problem. I suppose that if I ever want to deck myself out in Hufflepuff regalia, I will have to make sure the crest with the badger is clearly visible. I don't mind though, because the badger is the most adorable and foresty of all the animals! I actually think that if I lived in the Harry Potter universe, I would have been a Ravenclaw. If I'd been admitted to Hogwarts at the age of 11, where would the Sorting Hat have put me? I was such a strong Ravenclaw back then. If the hat had given me a choice between Ravenclaw and Hufflepuff, I would certainly have chosen Ravenclaw. Now, I would choose Hufflepuff. And J. K. Rowling agrees. Yay, you're finally a Hogwarts student! *hugs* I'm Gryffindor, but I was sorted many years ago when I was more confident and out there, heh. Yay, thank you! I think if people were sorted at different stages of their lives, they'd be put into different houses. It's interesting. I'm a hatstall, too - equally drawn to Gryffindor and Hufflepuff, but just like Harry who told the hat where he wanted to go more I chose Hufflepuff in the end (when Pottermore first launched, I was a Gryffindor, with the new version I'm in Hufflepuff). By the way I always thought that the canary yellow from the official franchise doesn't match what I know about Hufflepuff at all so I made my Hufflepuff scarf with something more amber-ish. I think that's a perfectly valid option. I didn't know the term hatstall before, but that's exactly what I am! And I like your colour scheme for your scarf, it's a good idea!